Teenage girls take part in a traditional dance moments before they are subjected to FGM in Bortek village Bukwo District. Photo by Daudi Nana. BUKWO. Violet Kisa a 22-year-old from Riwo sub-county in Riwo village, Bukwo District has firsthand experience of the devastating consequences of Female Genital Mutilation (FGM) — cutting girls’ education short. She was mutilated when aged 15 and forced into marriage by her parents soon after. She deeply regrets it. “Maybe I would be a doctor, an accountant or a teacher, I could have been professional,” she told PML Daily. In Sebei sub-region’s Kapchorwa, Kween, Bukwo districts, and Karamoja’s Amudat and Moroto when children return to the classroom in a circumcision year, some faces don’t make it – the faces of girls. The girls are absent not by choice, not because they don’t want to study but because during the holidays they undergo FGM. Kisa is now a peasant farmer and lives in Bukwo, a part of Sebei where according to Law and Advocacy for Women in Uganda [Law-Uganda], up to 65 percent of girls endure FGM. The practice entails chopping off of parts of a girl’s private parts. Traditionally, this brutalisation is considered to be a rite of passage into womanhood and once a girl is cut the countdown to early marriage and pregnancy begins. Law-Uganda is a non-government organisation whose mission is to use the law to advance the rights of the girl-child and women and also promote gender equality, labour equality. The organisation works with ministry of Gender, Labour and Social Development, UNFPA-UNICEF. Kisa today recognises that FGM has wrought untold disaster upon her community. It has denied girls dignity, abused their rights and grossly interfered with the development of her people. She said every year she watches with concern as the number of pre-teen girls in school dwindles. “They underwent FGM; they just disappeared after FGM because parents force them into marriage, they get married as teens and their lives just go like that,” said Kisa. Rev. Fred Kiprop of Sebei Diocese recalls how a girl from his Kapkworos village was due to become the first female to go to a secondary school in 1986 but her dreams were dashed after she was forced to undergo FGM. “And after FGM, the young girl then about 14 was forced into marriage by the parents, got children whom the husband could not look after and she now makes a living by digging other people’s gardens to support her family,” said Rev Kiprop. The tragedy of Kisa’s life story may be depressing, but she is not alone. She is one of the teeming numbers of teenage mothers in Sebei who have undergone FGM and been forced into marriage at teenage. Although UNFPA estimates that less than 1% of Uganda’s population practices FGM, the practice is widespread in some far eastern and northeastern communities including; the Pokot and Sabiny peoples,. Here, above 95% and 65% of the women, respectively, are compelled to undergo FGM. 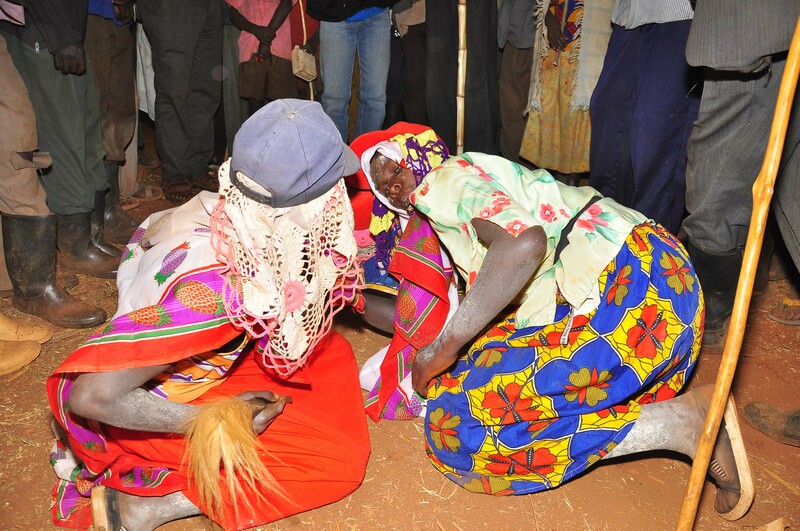 It is also reportedly widely practiced among the Tepeth in Karamoja’s Moroto. The Archbishop of Church of Uganda Stephen Ntagali while flagging off a marathon which was run around how to eliminate FGM in Sebei sub-region, said FGM is not only de-humanising to women and the girl-child but is also brutal, inflicts permanent injuries and poses a great danger to girls and their children during child birth. Archbishop Ntagali also observed that although it is true that government passed the 2010 law against FGM, it is not enough. The government has to ensure that the law is implemented; to have the perpetrators arrested and prosecuted. He said that although Sebei has very many girls with talent and creativity, FGM, violence, discrimination and the lack of equal opportunities repeatedly thwart their dreams and potential. Referring to international and national instruments to address FGM, the officer in charge of UNFPA Uganda country office Dr Eric Akinele said it is possible to give up FGM without giving up the meaningful, positive aspects of the Sabiny culture. UNFPA has pledged to continue the fight against FGM together with UNICEF with funding from Finland, Germany, Iceland, Italy, Ireland, Norway, Luxemburg, Sweden and the United kingdom. The executive director at Reproductive Education and Community Health [REACH], a local NGO involved in the fight against FGM, Beatrice Chelangat says ending FGM is a complex process. It requires behavioural change in negative social norms of society. Her observations are confirmed by the executive director Law-Uganda, Dora Byamukama who notes that although there are positive results in implementation of the law that prohibits FGM, the practice still persists in less educated homes, in the bushes, caves, isolated places and across the borders in Kenya. “We have held talks at East African Community level to come up with a law on FGM and how it can be implemented. And since it is taking place in Kenya and Uganda, we are asking governments in the East African region to classify it as a cross border crime,” said Byamukama. She named Tugumo, Kwot, Benet, Kaptanya, Girik, Kwanyiny and Ngenge as the hot spot areas where the culture of FGM is still persisting due to low levels of education of girl children. She spoke about the excruciating pain girls and women undergo, often at the hands of cutters in non-sterile conditions. This, she said, poses serious long-term sexual and reproductive health consequences for the survivors. The UN women magazine 2015 report dated October 11, says there are over 700 million women alive today who were married before the age of 18 — and that more than two thirds were married before 15 years. UNFPA estimates that 120 to 140 million women worldwide are subjected to FGM, with three million girls in Africa continuing to be at risk each year and that each day 47,700 girls are derailed. The UN women report says that FGM is one of the things standing in the way of girls’ progress coupled with early and forced marriages. Kapchorwa District health officer, Dr Michael Muwanga, has pointed out that among the salient issues cited as effects of FGM serious threat to the health of women and girls, increasing vulnerability to HIV, raising the risk of maternal and infant mortality and harming psychological, sexual and reproductive health, severe pain, haemorrhage, tetanus infections, cysts and urinary inconvenience stand out.